While I’ve been aware of Humans for a few years (and it was on my list of shows to watch), I am a newcomer to the series having only gotten around to watching the first two seasons a few weeks ago. The show quickly became one of my favorite binge watches of the past few years and I enjoyed every second I watched. I especially loved that the first two seasons are a story about robots who (mostly) don’t want to kill or enslave humanity. While the series also showcases the problems synthetic robots could cause, the show is a pretty optimistic look at a world with the technology. I’m an eternal optimist, especially about technology, so I always love seeing more positive sci-fi stories. Humans 3.0 is still the same great show it was in its first two seasons but in my opinion, season three is a slight step down. This is mainly due to how much darker and depressing this season is. However, Humans is still a very high-quality sci-fi show a lot of you have probably never heard of. For those unaware with this show, Humans is a British sci-fi series about a world similar to ours, but technology has advanced so far that most families have a synthetic robot in their home. These “synths” make life easier for their owner and are capable of doing nearly any household task, along with many other things (including some risque “adult options”). They do not have feelings, think like humans, or have any other traits of regular human beings. Joe Hawkins gets a significant discount on a synth (Anita) and decides to purchase it for his family since his wife Laura (Katherine Parkinson) has been spending a lot more time at work. Unbeknownst to the Hawkins, Anita (Gemma Chan) is actually a conscious synth named Mia who was kidnapped from her “family” of other synths like her. These conscious synths include Max, Fred, Niska, and half-human/half-synth Leo Elster. The Hawkins quickly figure out that their synth isn’t exactly what they were expecting and along with their teenage daughter Mattie, they become allies to this group of conscious synths. Humans 3.0 kicks off one year after the events of season two. If you haven’t watched that season yet, you probably should watch it before continuing on with the rest of this review as there really is no way to talk about this season without spoiling the events of the second season. Spoilers for season two are included in this review from here on. Season two ended with Mattie releasing a code update that made every synth in the world conscious. While the synths are enjoying their new freedom, this also came with a devastating impact to the world. More than 100,000 people died on what is now considered “day zero” (people flying in synth-controlled planes, vehicle accidents, and things like that) and human/synth relations are not doing very well at all. In fact, synths are constrained to their own small communities (our favorite synths are living in an abandoned railyard) with a curfew and regular power surges. Things only get worse at the end of the season premiere, causing violence against synths to rise and hate groups start popping up left and right. Laura is now a synth-rights activist aiming to help ease tensions between humans and synths. Joe is separate from her and living in a synth-free community. Mattie is in grief over causing the deaths of thousands of people. Our favorite synths are all over the place: Max is leading the community of synths at the railyard, Mia decides to become a synth-version of Rosa Parks by trying to live in human society, Leo is struggling with his injuries from the season two finale, and Niska is off on a side quest. Obviously Humans 3.0 is a very topical season as you can tell they were inspired by the xenophobia hitting Britain, America, and other world powers (in a behind-the-scenes featurette they even confirm that Brexit was a big inspiration to this season). Some scenes in this season are very hard to watch, especially with all of the hatred going around in real-life these days. Episode six is particularly gut-wrenching and heartbreaking (but also one of the best episodes of the series). While I won’t spoil what happens, the ending to the episode might be one of the most heartbreaking scenes I’ve seen on television (and features some amazing acting from Katherine Parkinson). There are definitely some dramatic episodes in this season, I just feel like the show went a little too dark this season. For whatever reason, it seems like the third seasons of a lot of shows are also their darkest years. Hopefully if Humans gets a fourth season, it will return to its more optimistic roots. Another thing that hurt Humans 3.0 a bit this season was the fact that the show’s most entertaining character is Niska and her story arc this season isn’t the best. Instead of exploring her budding romance with a human, she is off on her own on a small side quest that really doesn’t go anywhere until the very end of the season. Luckily, some of the entertainment that went missing with the lack of Niska was replaced by a great new addition to the show, Stanley (played by Dino Fetscher). Stanley is a new “orange eyes” synth (which were created to be completely safe and controllable synths after day zero) and most of the humor in this season comes from his performance. However, he isn’t just comic relief and his character is important to the story as well. The story in Humans 3.0 is still pretty great though, it is a logical expansion from season two and the series has certainly done a better job of continuing its serialized storyline than a show like Orphan Black did at this stage in its lifespan. I just wish the season wasn’t so sad and depressing, especially with what’s going on in the world right now. The first few episodes of the season are a little dull but by episode four, the show starts to pick up again. Outside of episode six, I don’t think it quite hits the highs the first two seasons had but Humans 3.0 is still very good and compelling television. I received the DVD version of Humans 3.0 for review but a Blu-ray release was also shipped to stores on the same day. Like the first two seasons of Humans on DVD, the video quality is acceptable but hardly impressive. This really isn’t a visually impressive series anyway, relying on lots of houses, apartments, and grungy abandoned buildings for most of the scenes (and the show is pretty low budget to begin with). Three bonus features are included in this release but they feel like three parts of a larger “behind the scenes” featurette. The first extra is the actual behind the scenes bonus feature and the other featurettes focus on the new railyard set, the new synths, and the other new characters in season three. None of the extras are must-see television but they do a serviceable job. It might sound like I was disappointed with the third season of Humans but it is still the great under-the-radar sci-fi show I loved the first two seasons of. I just wish Niska was used more and a little bit more optimism accompanied the depressing storyline. All sci-fi fans should give the show a chance. I would say the first two seasons of Humans are worthy of a 4 out of 5. Humans 3.0 is just a tiny step down to a high 3.5 out of 5. Humans 3.0 was released on Blu-ray and DVD on January 29, 2019. 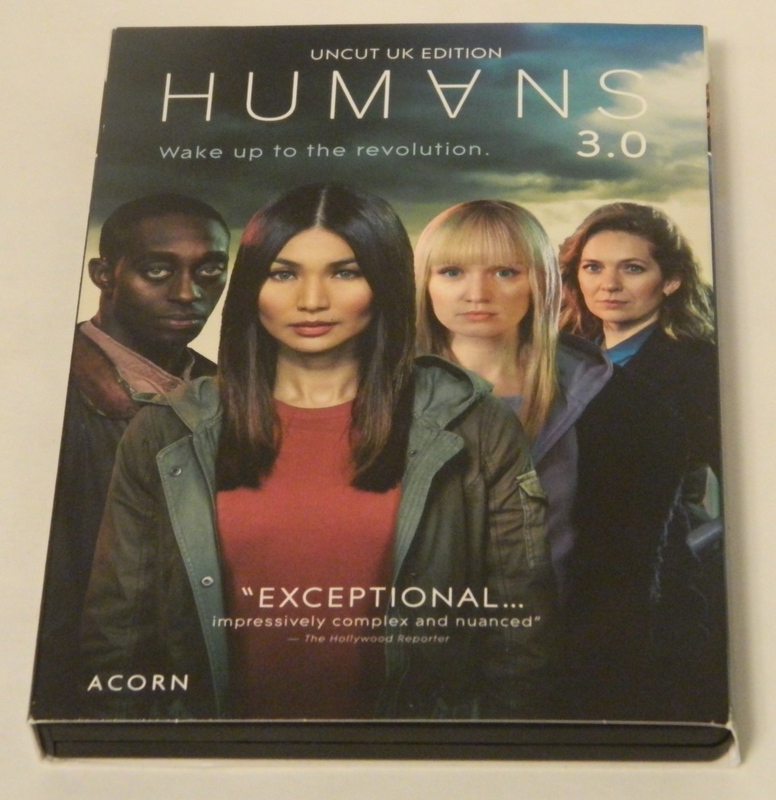 We would like to thank Acorn Media for the review copy of Humans 3.0 used for this review. Other than receiving the review copy we at Geeky Hobbies received no other compensation. Receiving the review copy had no impact on the content of this review or the final score. Still the same great show, just with a small step down in the story. Some great new characters are introduced, especially Stanley. I preferred the more positive and optimistic stories from season one and two.